Angala Parameswari is a manifestation of Mother Goddess Shakti. 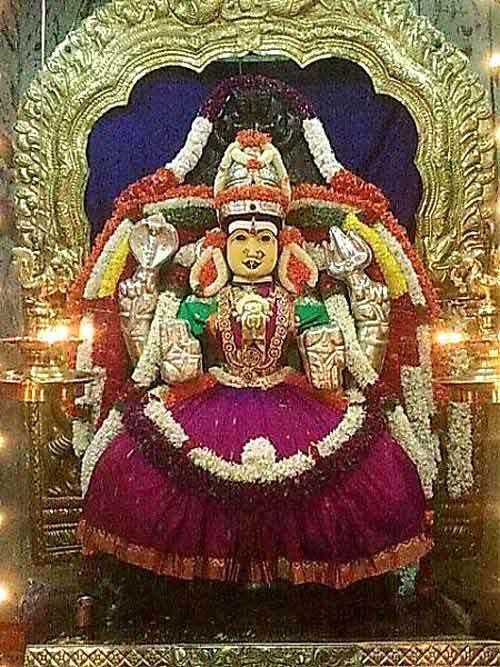 In this form she is mainly worshipped in Melmaruvathur and Villupuram District in Tamil Nadu. She is believed to be the daughter of Parvatharajan (the lord of mountains) whom the inland fisherman in Tamil Nadu considers as their ancestor. The popular belief is that she is Adi Shakti who created the entire universe and Hindu Trinity. She is also the wife of Shiva. She also appears on earth to annihilate all those forces that thrive on Adharma. Legend has it that it was Angala Parameswari who got rid of Kapala from the hand of Shiva. The kapala – the fifth head of Brahma – had made his residence in the hand of Shiva. It is believed that she gave darshan to her devotees at Melmaruvathur in the form of an ant hill. Her most favorite spot is the cremation ground. A temporary image of her is created on the cremation ground from ashes, bones and mud for festivals. Permanent structures in cement and stone of her can also be found in places where this form of Mother Goddess has large following. In some temples she is worshipped in murti form. Here she holds trident, sword, kapala (skull) and damaru (percussion instrument). Worshipping her helps in curing mental and physical illnesses. She is also believed to bless couples with children.